Hi, everyone! I hope you've all had a great week, so far. I'll post more on this later, but we've been busy in the bargain shopping world, lately. My husband was promoted, and went from wearing scrubs at work to having to wear dress shirts and ties! We've had to shop for a whole new wardrobe for him! While we have purchased some things brand-new (but not without shopping some serious sales! ), we recently found some great dress shirts and ties at Goodwill—shirts for $2.50 and ties for $1.50. Now, you just can't get any better than that! I love bargains!! Now, it's your turn . . . This is just too cool . 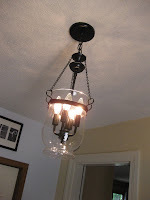 . . Amanda at The Hand Me Down House took this old, yucky brass lamp and turned into a gorgeous Pottery Barn-inspired chandelier! I get soooooo inspired when I read through all your ideas! 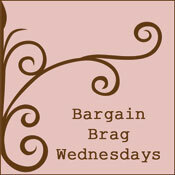 Thanks for sharing them in last week's Bargain Brag Wednesday.